Former Republican Rep. Ron DeSantis said he should not be held accountable for his speeches at far-right events and donations he received from racist supporters. 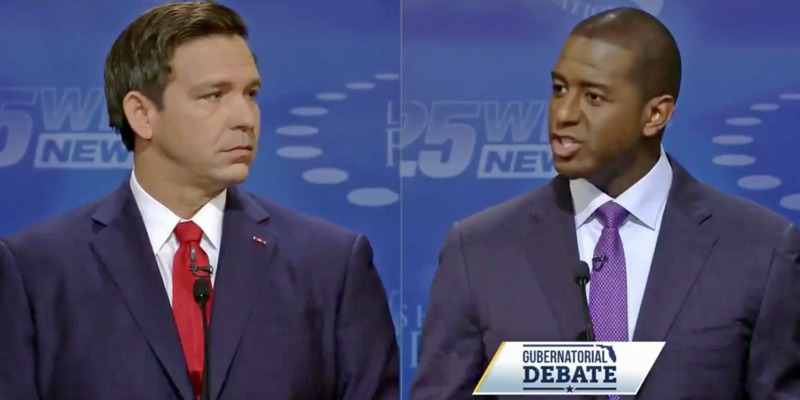 That was part of a heated gubernatorial debate between DeSantis and his Democratic opponent and mayor of Tallahassee, Andrew Gillum on Wednesday night. Audience members attending the final gubernatorial debate between Tallahassee Mayor Andrew Gillum and former Republican Rep. Ron DeSantis erupted in cheers after Gillum challenged DeSantis for giving speeches at far-right events and accepting donations from a person who called former President Barack Obama a racial slur. The former Republican lawmaker was also accused of accepting around $US20,000 from a Republican activist who called Obama a “F—–G MUSLIM N—-R.” DeSantis’ campaign reportedly said none of the activist’s donations were made in the general election, and that the campaign returned some of the money. The two candidates squared off in the debate on Wednesday evening in West Palm Beach, Florida, where a Florida poll shows Gillum leading by one percentage point – a statistical toss-up.